Aside from my lost voice, sore throat and hangover, today is a pretty damn good day. It's the one day we have to recuperate before we do it all over again on Thursday which hopefully leads to another day off so that we can REALLY do it all over again on Saturday. I just have a few thoughts from last night, so in classic bulleted format, we'll just lay these out for you. During the starting lineups, the lighting displays the signature of the Blazers player that is about to be announced in sort of a swirling motion. So last night, as Roy is getting announced, I look over to the Rockets bench and sure enough, Von "Ton" Wafer deliberately walks over and does a little warmup dance on top of Brandon's signature. Take what you want from it, but karma is a huge b***h.
Foul differential of 12 in favor of Portland. A big thanks to Nate for those comments and the $25K hit? 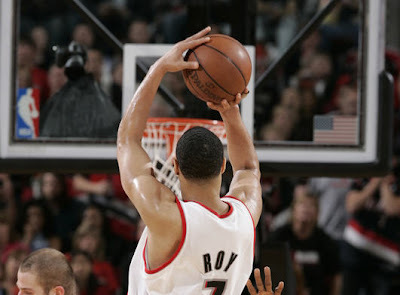 Or maybe just a more aggressive style of play from "your" Portland Trail Blazers? You decide. Carl Landry +6...the rest of the Rockets all in the negatives. Aaron Brooks is going to be one hell of a player in this league and for Oregonians, it's pretty cool to see. Also nice to see him get a positive round of applause during announcements. However, 6 of 20 from a guy who's technically the third option and barely out of his college diapers, is not cutting it. Coaching move of the year - Rudy comes in early off the bench? An immediate impact from Fernandez that set the tone for the entire game. Sure, the Rockets made a couple of runs, but Rudy's energy really made the difference. I'm sure Shane Battier is feeling like he just ran a half-marathon. Speaking of Battier...Mr. Walnut buzzed the head again. You know how we feel about sports and superstitions. Not a good choice! We begged for Ron Artest to continue to shoot and he let us down by only chucking up 9 shots. Fortunately for our cause, he continued to underwhelm in every other category as well. Keep it up big guy. Is Luis Scola cracking the top 5 on the Blazers Fanbase's Most Hated list? Not sure I could even count the number of signs I saw last night related to his greasy mop. The girl sitting next to me even belted out a "Get a hair cut!" just 10 seconds into the 1st quarter. That must be a record. And the Przybilla vs. Yao "eat the head!" sign was an instant classic. You can view it on ESPN Classic this afternoon at 3:30. Nice work again Brandon and LaMarcus. Any other thoughts you had from last night?